And then came the blessed day when my inbox contained the words: The following item(s) are being held for you: The Year of Billy Miller. The boys and I had been reading Homer Price, but I asked them if we could just try out the first chapter of Billy Miller, and after that we couldn't stop. Sorry, Homer. Billy Miller is seven years old and starting the second grade. As he walks to school on that very first day, he is consumed with worry that he won't be smart enough for second grade.The worry began a few weeks before when he fell on his head during a family vacation. Afterwards, he heard his mom expressing her own worry that even though the doctors said he was fine, he might have retained some damage that wouldn't show up until later. With a beginning like that, you might think the story's going to be about head injuries and learning disabilities and fitting in, but it isn't. 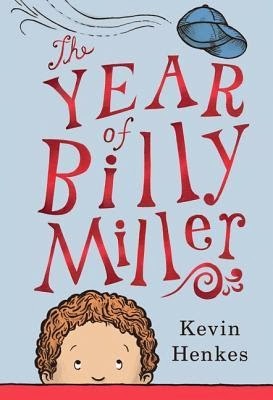 It's just about Billy, an average kid with a blessedly simple set of average problems: when he stops worrying about being smart enough for second grade, then he starts worrying about how to say he's sorry to his teacher, Ms. Silver and how to help his dad not feel so discouraged and how to write a meaningful poem for his mom. With so many of today's books tackling big issues and giant problems, I can't tell you how refreshing it was to read about a little boy with just some everyday worries. Of course, since I'd already read Betsy Bird's review, I couldn't help but compare Billy Miller to Henry Huggins. Even so, the similarities are striking enough, I like to think I would have made the connection on my own. For one thing, Kevin Henkes writes in that same simple but perceptive style that is so pronounced in Beverly Cleary's works. He knows just the right things to highlight without making an overly big deal about them. For example, this note that Billy writes to his three-year-old sister: "Dear Sal, Will make it to morning next time. Your ok. Your brother, Billy." The misspellings are realistic. In spite of what he thinks about himself, he's a bright kid. He isn't going to misspell "morning" or "time," but he probably isn't going to remember when he should use "your" and when it should be "you're" instead. Ironically, these are mistakes that a seven-year-old who is reading this book probably won't even pick up on. Another similarity to Cleary's writing was just in the way the story was organized. It was divided into four parts ("Teacher," "Father," "Sister," "Mother"). Each part was like a little snapshot of an incident from Billy Miller's second grade year. We get a glimpse during the first week of school, the second when it's fall, another when it is cold enough to snow, and the final one when spring is in the trees and summer break is on the horizon. In between, there are gaping holes where we don't really know what's happening in Billy's life (but we can assume it isn't tragic or life-changing). For example, at school Billy sits by a girl named Emma who is stuck up and condescending. Towards the end of the book, Emma looks over at a picture Billy is drawing on an invitation and makes a rude comment. Then comes this: "Billy moved his drawing closer to his chest and tightened his grip on his marker. After months of sitting by her, Billy had learned that the best way to deal with Emma was to ignore her." Because the book only focuses on a few select experiences (with a lot of the "action" happening at home), we don't really see this learning taking place; we simply see the end result. I think the point of a story like Billy's is not so much about what happens but about how it affects and changes him. This is exactly like Henry Huggins: there's the chapter about him digging up night crawlers to fix a mistake, and then we fast forward to the Christmas play. In both Billy and Henry's case, the result is the same: as the reader, we get some excellent, self-contained stories that contribute to the overall character development of both boys. One last similarity between Henkes' and Cleary's writing is that each chapter has some sort of special, poignant moment. It's not overly gushy or sentimental, but it's there to twist the reader's heart just a little. Like this one when Billy apologizes to Ms. Silver (for something he didn't intentionally do but which he is perceptive enough to know hurt her a little nonetheless): he brings her a half dozen silver objects (to go along with her name), and then he whispers, "'I'm really a nice person.' He couldn't look at her, but he could feel her eyes upon him like a net. His heart was thrumming. 'I can tell you're a nice person,' she said. Billy sighed. 'A very nice person.'" Aaron and Maxwell loved this book, which kind of surprised me since it contains very few pictures, and all of them are small and only of a single object (a hat, a bird, a bowl, etc.). I guess all of our other chapter book reading paid off and paved the way for this one. In fact, even days after finishing it, Max was still asking, "Can we read Billy Miller now?" and then I had to sadly remind him that we had already finished it. Overall, we probably liked Henry Huggins slightly more than Billy Miller but only because Henry dealt more with bugs than poetry. The feeling we got from both books was the same, and I certainly hope Billy Miller has many more stories in his future. P.S. Can anyone tell me where I can find a babysitter like Gabby (the teenager who stayed overnight with Billy and Sal)? Before Billy's parents come back, she says, "Let's get your rooms in shape before they get here" and "I can make you something to eat right away, or we can make a big brunch and wait for your parents to get here." Do babysitters like this really exist?!?! Thanks, Amy, you've really given me a good sense of this appealing book. We read this one aloud and based on their begging to read more I think it was a winner at our house.